It seemed like a good idea… But then reality came knocking. After my initial burst of hope, expectation and optimism surrounding the £35 model railway challenge set last month reality to set in. 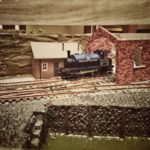 If you haven’t read it already, read my first post on the £35 model railway challenge. The goal is to build a fully operational railway for just £35 — including all the track, trains, electrics. But the initial wave of confidence collapsed as soon as I started to price up the various parts of the build. 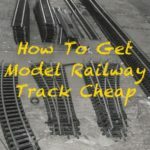 Breaking down the various elements of a model railway along with estimates of how much I could afford produced the following daunting set of figures. I knew it was going to be a challenge but ouch. Just £15 for track, locomotive and rolling stock??? And £10 for the controller and wires? 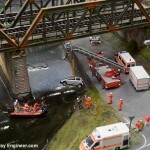 Who’s idea was it to try and build a model railway for £35??? Had I set myself an impossible mission? I began to wonder. That £100 charity donation looked likely. But when I set to planning it was actually enlightening. When you have a hard budget a lot of decisions are made for you. There simply isn’t the luxury for tons of track on a large layout with lavish landscapes. This layout will have to be small, fun and simple. Take the £15 limit on track and trains for example. The forces the decision re gauge. The huge amount of second-hand (ie cheap) Triang and Hornby OO gauge track and rolling stock available makes this a no-brainer. I thought about N gauge and even HO but they’re just too expensive. 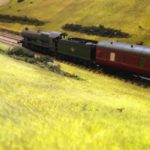 Choosing OO gauge also has the advantage that it’s arguably the easiest and most common and so beginners reading this can join in with their own versions of this project. And with just £5 for the track, the plan is going to be small which also makes the design easier. Forget layouts measured in feet. £5 for track, even second hand, isn’t going to allow that. None of the layouts in the usual track planning resources I usually use will be possible. No. If I’m going to stay within my budget the construction is going to be tiny. With this in mind, I turned to the wonderful source of small layouts that is Carl Arendt’s www.carendt.com website. Here are dozens of tiny track plans. I must have spent days looking that the pictures and plans there, thinking, dreaming and contemplating. In the end, however, I went for a variant of one of the classics Carl’s Imports. This is a simple industrial shunting theme with a single line feeding a siding and a shed with a second line operating in the background. My version, above, retains the wharf, complete with cranes, at the front but also features an exposed cliff face at the rear. This cliff face will also curve around to the left with the two lines disappearing into tunnels and so be disguising their otherwise early demise at the layout edge. Although simple, this track plan also has a number of advantages for my project. One set of points, some curves and straights. It will hopefully be possible, a micro track plan on a micro-budget of £5. My budget won’t stretch to digital so a simple track plan that will work on good old fashioned, cheap, DC is critical. I’ll get to this in the next post. Notably, the parts and construction of the framework and baseboard on which it can be built and getting the track and electrics. Can the electrics and trains and rolling stock be purchased spending no more than £15? The main aspect of the plan above is obviously the points but either side of this are straights and curved track. I’m hoping I can find a job lot of track that will provide the necessary bits for a fiver at a boot fair or on eBay. Failing this, a single strip of flexi-track and the point might be possible. 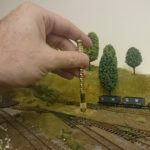 If you’re dreaming of building a model railway, why not join me and have a go at building this layout yourself. The track plan above is a great place to start. Watching the £35 plans with great interest. Have you already got a layout? £35 is a tight budget and it will be interesting to see what you can produce. I am working on a similar project but with a slightly more ambitious budget of £100. Last year Hattons were selling the the Caledonian Belle train set for £35 (now priced at £45) which I considered a bargain. I decided to use it to build an OO layout based on the track plan of an N gauge layout called “Pizza Hill”. The layout is basically a double helix, one going up and the other coming down forming a continuous loop. I did a track plan on SCARM and found that I could recreate the layout in OO using Hornby R1 and R2 curves. Unfortunately the curves in the set are all R3, so I needed to purchase a complete set of track. I found that it was possible to pick up bundles of cheap good condition track from swapmeets and exhibitions and now have all the track for the layout for less than £10. I now just have to find the time to put it all together. Hey Neil, That sounds like a fun project – will be good to hear how it develops. Funny you mention the CB; I’ve got my eye on a couple of eBay auctions with that for this project (that and it’s relative Smokey Joe). They go very cheap and, with a bit of work, could fit my theme. Totally agree re swapmeets and exhibitions. Planning my calendar for the next few months at the moment to get to as many as possible. When will you lay the track? The difficulty with the double helix arrangement is that each section of track will be on an incline. 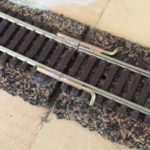 This will mean building up the track bed from the baseboard at the correct angles, which I am sure will take much longer to complete than laying the track. I have been putting it off because I know it will be difficult, but I hope to have the track laid in a few weeks.